Welcome to The Bunker LaserTag, a fast-paced real-life version of your favourite first-person shooter video games. Our main game arena is a tailored-made, multi-level indoor map within the walls of a genuine Cold War Nuclear Bunker. This atmospheric gaming environment and our team-based scenarios deliver a laser gaming combat experience to remember. We use the latest technology from Battlefield Live Indoors in the form of our formidable Cobra live-gaming guns. 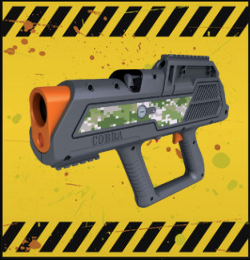 Packaged in a lightweight, sturdy poly-carbonate body shell, these guns are suitable for all age groups and hold an array of sophisticated technology inside to ensure the best laser combat experience. Realistic gun sounds, live feedback, multiple life and ammo options, and personal stats displayed on each guns LCD HUD screen make our system second to none. We'll give you the firepower... you provide the wits, intelligence and winning strategy. For groups that book an exclusive session with Bunker LaserTag, we also have our amazing outdoor Urban Apocalypse game map for an even larger variety of fun missions. Of course, if its raining, we can stay inside in the dry and leave that outdoor stuff to those crazy paintballers. We offer a variety of game options, from straight forward turn-up and play sessions held every Saturday from 10am-1pm to exclusive, tailored group bookings and party packages where we organise everything to ensure your event is a roaring success. You will then be led to the Bunker itself and the upcoming game scenario will be explained to you before the doors open and you are immersed in to the action! Drop-In Games run every half-hour on Saturdays with Open Play for all ages. Just turn up and play - no booking or minimum group size required. See Saturday Drop-In Games for full details. 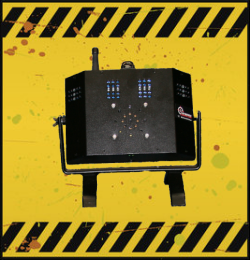 Bunker LaserTag is available for bookings Sunday-Friday from 10am to 5pm and on Saturdays from 1pm-5pm. We are also available by special arrangement for evening games (please contact us to discuss - there may be a surcharge due to extra staff costs). To book, call us on 01392 464 032 or click on the Book Now button under the Exclusive Group or Birthday Party package of your choice.